Growing up in suburban America during the 1960's and 70's, my main musical experiences came from the radio, records, and the Music Program in the public school system (a program that not only existed, but was substantial). The radio connected me to millions of other people and together we listened to an explosion of music that was new, exciting, and ground breaking. Music was never going to be the same again. This communal sharing of such daring music was a revelation. It was mind blowing. I didn’t know it at the time, but I was developing a taste for the 'new', for the 'other' - for all of those peoples, cultures, and musics that I didn't know. I was forever hooked on 'the possibilities' and 'the unknown.' The public school system changed my life in other ways. My Junior High School music teacher suggested I try the double bass. Mr. Gillian show me how to play my first two notes on the instrument and the next minute I was in the jazz band playing 'Eleanor Rigby'. I came home from school that afternoon and told my parents that I wanted to play the bass for the rest of my life. And what a life. The sense of exploration and discovery that I experienced from the radio and on my first day with the bass have never stopped. As a result, I've focused my performing energies on New Music. New Music - an unending source of challenges and discoveries. New Music - never sits still, never runs out of ideas, never ceases to thrill, amaze, and engage. New Music - it has taken me throughout the world, involved me in technology, improvisation, world musics, pop music, and all things traditional and experimental, It has allowed me to collaborate with actors, dancers, painters and musicians of all sorts. 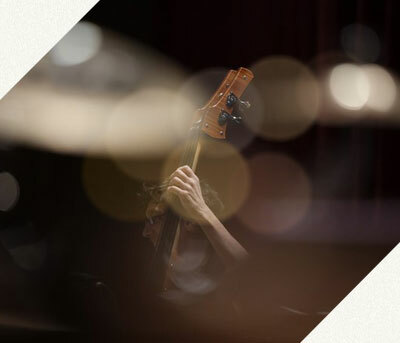 This same passion for exploration and discovery has led me deeper into the history of the double bass and its repertoire, which has led me deeper into the performance of the Classical Literature and the world of Teaching. Teaching - another passion. I've had many mentors, people who have reached back and grabbed my outstretched hand, pulled me along and propelled me forward, showing me everything along the way. And now, with my outstretched hand still being pulled, I can reach back and grab the outstretched hands of others, helping them along, propelling them forward, showing them. So the circles complete. The Helped becomes the Helper becomes the Helped. Performing becomes Teaching becomes Performing. The New becomes the Old becomes the New.